In your course, go to Administer Students > Students. Click on the button that says Invite Students. 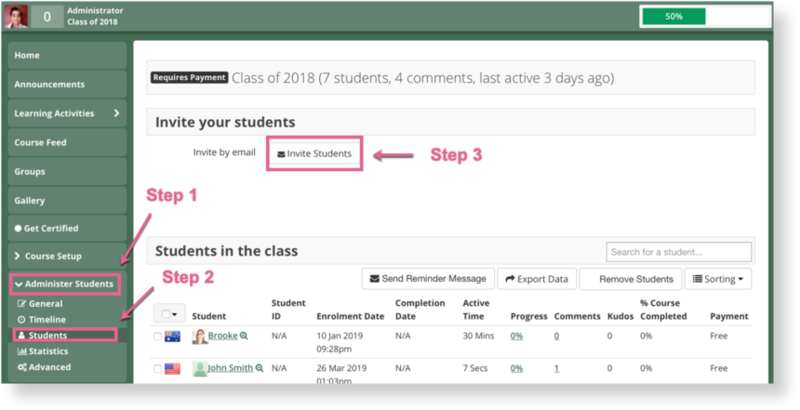 Type the email of the student you wish to invite into the box. You MUST tick the box next to Send Email to Student if the student does not already have an OpenLearning account. Otherwise, they will not be notified. You will see this notification explaining that the student has been automatically enrolled into your course. However, unless you ticked the Send email to student box, the student will not be notified that they are enrolled. You would have to contact them manually to let them know. If you did tick the box, the student will have received an email with a link to the course and instructions on how to proceed. The notification you receive after inviting them will simply state that the student was invited to the course. The student will receive an email notifying them that they were invited to the course. This email will instruct them to create an OL account and provide details on how to complete their enrolment in your course. When an email has been invited (and they don't yet have an account), they will show as Invited in Administer Students > Students until they create their account. Once they have created an account, they will appear in the student list. With an activation code, students can gain access to your course via inputting the code on the course landing page. 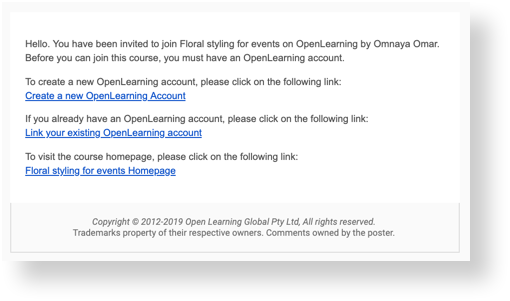 There isn't a way currently to send an invitation email from OpenLearning that includes the activation code. To share the activation code with students, you would need to manually email it to students or share it via your various channels.